The Meadows Road Bridge located on Meadows Road south of Hellertown Borough, spans the Saucon Creek. Built in 1858, it is one of only two examples of a four span stone arch bridge built between 1826 and 1921 that exist in today in Northampton County. Stone arch bridge construction predates the covered bridges and was the only technology available to the early settlers for longer and permanent spans prior to the introduction of metal truss bridge technology. 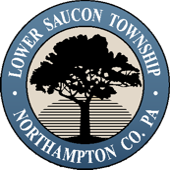 By authorizing the sum of $899.47 for the construction of the Meadows Road Bridge, the Northampton County Commissioners recognized the need of the local farmers to transport their grain to the Levi S. Moyer grist mill. Northampton County tax records for 1860 show Levi S. Moyer to be the wealthy owner of this grist mill. The handsome stone mill was built in 1829, continued operation as a mill for 110 years and still stands today. Farmers utilized the King's Highway (known as PA Rte. 412 today and was the original "Walking Purchase Trail") then crossed the Saucon Creek over the bridge and traveled another 300 yards to the mill. Also operating in the immediate area, when the bridge was built, was the Stevers Mine. It was an open pit limestone quarry mined by J.D. Heller. Dr. Heller used horse and cart to transport the limestone to local farmers. 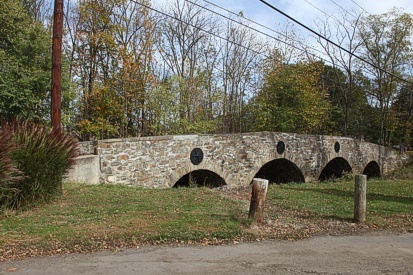 Today the bridge is the oldest bridge in Lower Saucon Township and one of the oldest stone bridges in Northampton County. By the 1860's the Northampton County switched to building primarily iron span bridges. The Meadows Road Bridge has been the focus of many local artists over the years, such as Fred Bees, Walter E Baum and in early 1900 post cards. In 2008, in celebration of the bridge's 150 years, the Lower Saucon Township Council authorized the placement of a historic marker at the bridge noting its local historic significance.